One of the great things about game publishing these days is how open the market is now to well-thought-out projects that just make things easier on GMs and players alike. You can craft a useful product that helps folks make their games more fun, easier to run, and full of verisimilitude without having the up-front costs for print runs and having to get it through distributors and… ah, the Old Days. 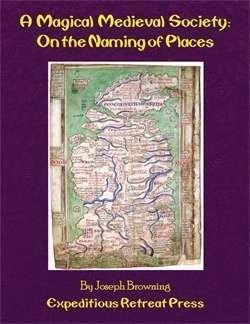 Anyway, A Magical Medieval Society: On Place Names is another Expeditious Retreat Press gem that will help any Game Master or player who loves words and their meanings. Need a cool place for the heroes to investigate? Need a cool-sounding place to be from that feels real? Bring the rich history of place names into your game! A Magical Medieval Society: On Place Names provides tips and tricks for GM interested in creating good place names for their campaign. Included is a 500+ word list providing detailed information regarding the historical naming of places in the UK. This powerful resource can be used as a guide for newly created words in a campaign language, or as a drop-and-roll resource providing limitless combinations right out of the gate. As varied and dynamic as the RPG hobby is, it’s not often you get to see something so utterly unique as the basis of a game. Night Witches calls back to a moment in time and a group of people that you may have never heard of before reading this, and I think that’s pretty awesome in and of itself. 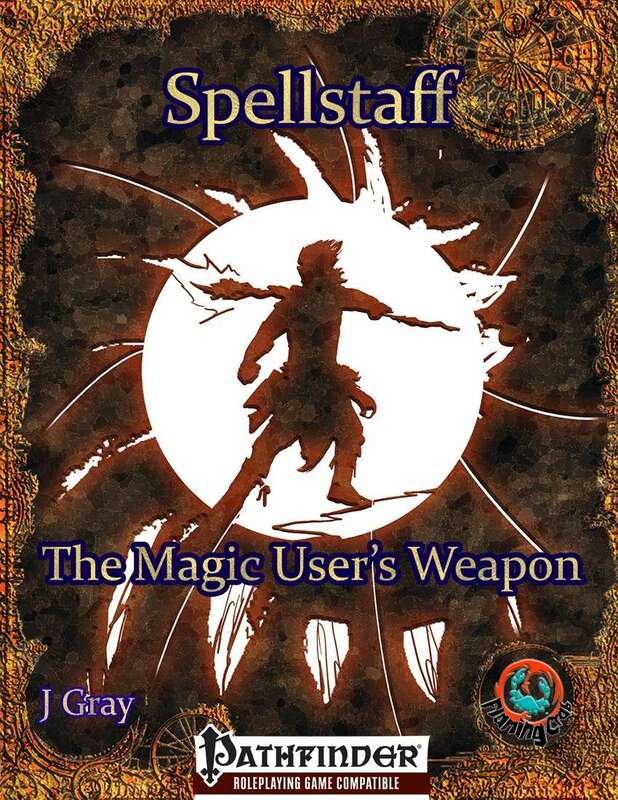 Inside: Rules for the spellstaff. Also included are traits, feats, archetypes, and plot hooks for the spellstaff! Archetypes: Serpentstaff Witch (Witch), Spellstaff Adept (Wizard), Spellstaff Channeler (Sorcerer), Spellstaff Dancer (Bard), Spellstaff Disciple (Fighter), Spellstaff Healer (Cleric), Spellstaff Scrapper (Brawler), and Spellstaff Shepherd (Priest)! Fully compatible with Sine Nomine’s free Stars Without Number d20-driven sci-fi game, this very successful Kickstarted product isn’t “just another Cthulhu game.” In fact, it’s both a horror game of its own accord and a tool kit to inject both utterly new terrors into your horror campaigns as well as make the job of throwing together a night’s investigations really easy for the GM. Silent Legions isn’t just about traditional Yog-Sothothery. 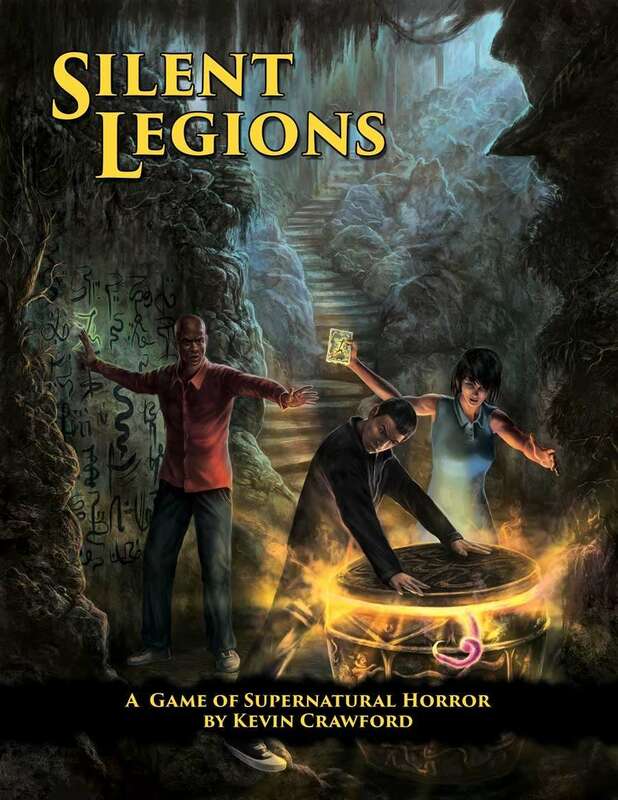 Silent Legions is a creation kit, a toolbox in the Sine Nomine style for creating your own Mythos, with all-new deities, alien entities, foul magics, accursed artifacts, unaussprechlichen kulten, and diabolical dream-worlds to bedevil your players. These tools are system-neutral, so even fans of other Lovecraftian gaming systems can scoop them up to add a splash of fresh horror to their more familiar tentacular abominations. Not only that, but Silent Legions is built to help the GM create investigative adventures with minimal strain. Within these pages you’ll find a modular set of templates and adventure guides that help you snap together an evening’s intrepid investigation and fit it neatly into your campaign setting. Like the Mythos creation tools, these guides are system-neutral and can be exported for any occasion when you need something wicked to this way come. It’s no secret I’ve been a fan of what Steve Kenson gave us with ICONS (especially the Assembled Edition). Here’s a very different take from the core themes – Fainting Goat’s Extreme Earth: A Dystopian Superhero Setting. Extreme Earth is a supers campaign setting inspired by the Iron Age of Comic Books. With eye-popping art by Jon Gibbons and evocative writing of Joe Bardales, Extreme Earth will transport you to a dangerous, dystopian world that can be described as 24 meets Heroes by way of the Iron Age of Comics. 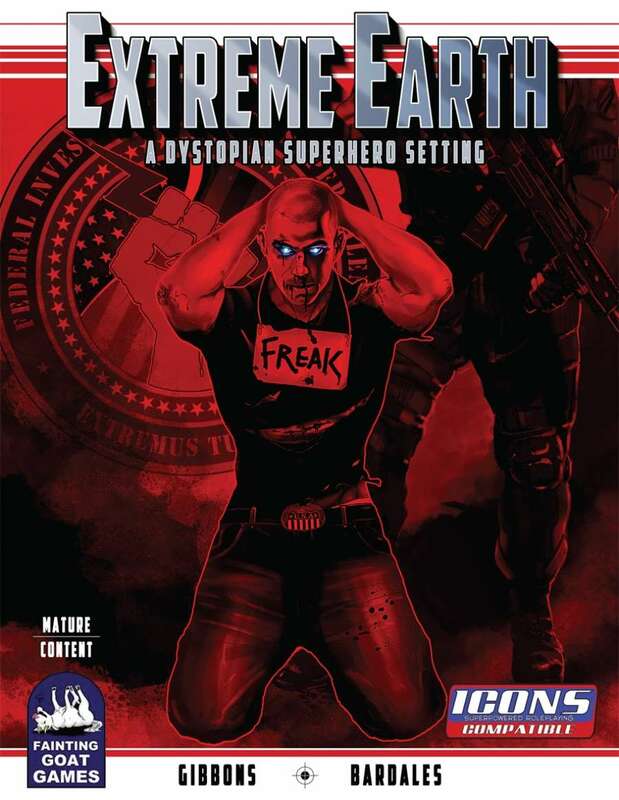 Extreme Earth will present information about the history and current state of affairs of this dystopian world, background dossiers on major players and organizations, rules for character creation, campaign advice for game masters to help bring the EXTREME EARTH setting to life, and a full introductory adventure. They open with this quote, and I felt compelled to do the same. 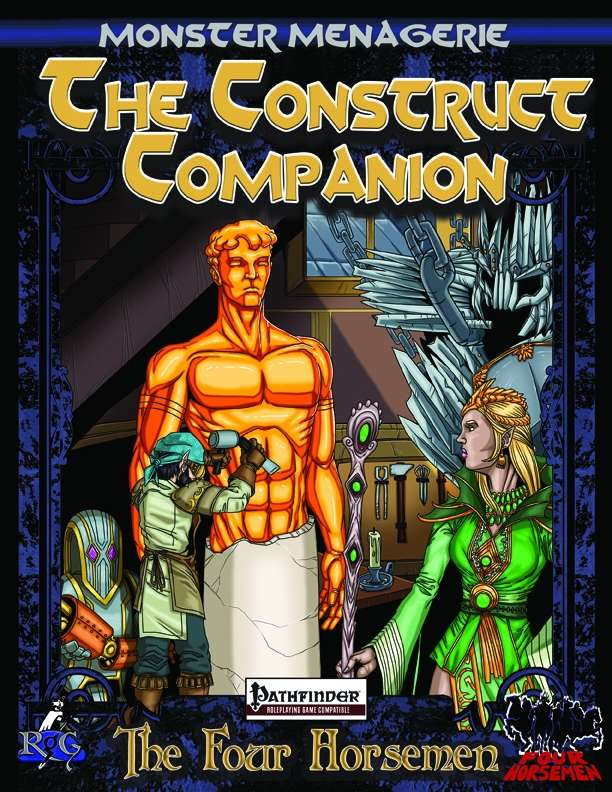 Monster Menagerie: The Construct Companion is another gem from Owen K.C. Stephens’ house, Rogue Genius. Crafted by the “The Four Horsemen,”including RPG Superstar winner Steve Helt, it’s a book all about constructs in your Pathfinder game. Scarily enough (sorry GMs), this includes playing a construct. New constructs to use as both antagonists and resources including animated objects, colossi, golems, and constructs. Rules for customizing existing constructs, and for creating them from the ground up, including new animated object abilities and complex modifications, rules for reanimated objects, animated traps, animated vehicles, templates for creating construct and golem versions of other monsters, and optional rules for expanding the animate objects spell. New paths for building characters including class archetypes, prestige classes, construct animal companions and familiars, new feats, new magic items, and two playable construct races. Mythic tier options including templates that bring sentience and power, on a more cosmic scale, to standard golems using themes such as artifice, death, love, madness, space, and time. Four new encounters featuring several of the unique creatures presented in the Bestiary chapter, complete with stats and treasure. OK, wow. I remember when this series of modules first started. I was still working for DriveThruRPG at the time, and I was very impressed with the sheer scope of this thing, not just the quality and unique aspects of the campaign. 0one Games pulled together their map-making expertise with some fantastic setting creation and adventure design to craft their Great City urban adventure line (which also ties into their incredible Dungeon Under the Mountain series), and The Sinking series launched as a non-linear series of adventures that act as a backbone arc of stories to found a very long-running campaign upon. 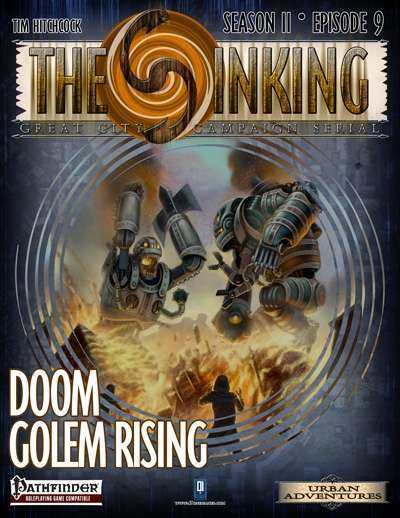 Like a television series, The Sinking had a very successful first season, and now we come to the end of the second season with Doom Golem Rising, which also marks the series finale itself. For me, this a momentous event in gaming; I was there to promote and support their efforts right at the start, so it’s my pleasure to present this last episode with an encouragement to check out the entire product line from 0One. This adventure ends The Great City: The Sinking series. It can be played as part of the series, or as a stand-alone adventure. It was designed using the Pathfinder RPG System and intended to be played with a group of 11th-level Player Characters. It’s hard to come up with something different in media, and there’s some added difficulty in coming up with an RPG experience that veers off of comfortable roads. Dogs in the Vineyard – winner of multiple awards and highly lauded as one of the more divergent roleplaying experiences you’re likely to encounter – is now finally available on DriveThruRPG. 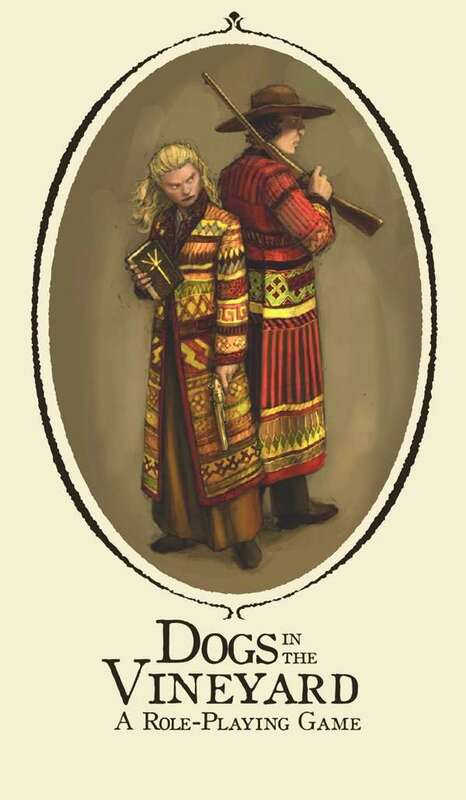 Set in the pre-statehood Utah territory with a re-imagined Mormon State of Deseret, you play a kind of Old West-era paladin in conflict with heretics and the US Government. 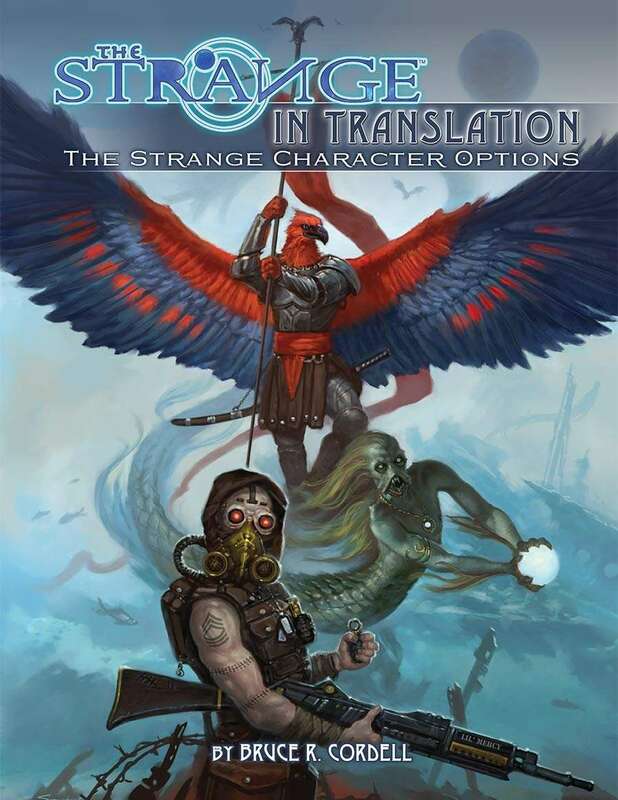 The Strange is all about moving from one world to another, and the translation process from place to place means the character shifts with the change of realities. This makes a book like this something of a necessity, or at least really helpful. Translating to a new recursion? It’s not just about visiting—it’s about becoming a part of it. About changing yourself. More than fifty new abilities for the three character types. Explore new moves for vectors, new revisions for paradoxes, and new twists for spinners. New descriptors, bringing the total number to more than thirty. Choose from options like Addicted, Crazy, and Slacker (because sometimes a character is best defined by a negative trait) as well as many standard descriptors like Introverted, Kind, and Jovial. Dozens of new foci, bringing the total to more than sixty available as characters translate between recursions. New foci include Builds Robots, Calculates the Incalculable, Casts Spells, Grows to Towering Heights, Pilots Starcraft, and more. Options for advancement beyond the sixth tier. Today’s Pick is for Dungeon World (AKA Apocalypse World Engine) fans – a veritable ton of stuff to provide many, many sessions of game play. Welcome to the Plague of Storms. Plague of Storms presents two campaign fronts for Dungeon World, half a dozen dungeons, three compendium classes, and a host of NPCs for the player characters to ally with, betray, befriend, antagonise, or murder – or possibly all of the above, in that order or some other. 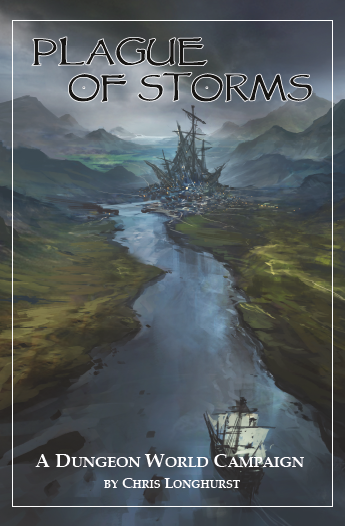 Plague of Storms provides a solid framework for a GM to weave their own story within while still remaining flexible enough to accommodate the swings in fortune of a typical Dungeon World game.